We are tagged as one of the illustrious Copper Sulphate suppliers in India. 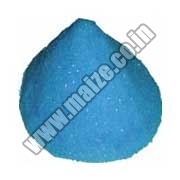 We proffer high quality Copper Sulphate that is known for its fine granules and free flowing nature. Blue in color and odorless, our Copper Sulphate Chemical is used as poultry, animal and cattle feed. Apart from this, these can be obtained at affordable prices in varied quantities.